On a run recently, I passed a narrow residential street featuring a traffic sign that was welcomed – but should be unnecessary. A reminder: there are many uses for a city street. Of course, one can make the case that most or all traffic signs should be unnecessary. If people using our streets would exercise common sense, fewer speed limits, parking restrictions and directional signage would be required. In an interesting experiment in London (UK), Exhibition Road was converted to a ‘clutter free’ zone with minimal signage. The London project went much further, removing all sidewalks and curbing to create one expanse of shared space. The idea is that, in such an environment, it is obvious to car drivers that they need to be cautious – there are no lanes dedicated to cars, or bikes, or pedestrians. In a dense location like London where there are plenty of pedestrians, a shared roadway gives them more ‘power’ than dedicated sidewalks did. In a suburban or rural area, of course, cars would likely dominate and the pedestrians would feel like risk-taking intruders. Cars have not always owned the right-of-way on urban streets. There was a time (almost a century ago) when trails and streets were the shared space of pedestrians, horses and wagons. In North America, businesses started building boardwalks that allowed their customers to get up out of the muck and cars gradually began to dominate the remaining street. So much so that in the latter half of the twentieth century we designed almost exclusively for car movement and car parking. Other uses were allowed when they didn’t slow the flow of vehicles. More recently, the “Complete Streets” concept is helping cities re-imagine their streets to ensure that they serve a parent pushing a stroller, a person with a bad hip walking with a cane, a cluster of kids on their way to school, and a cyclist heading to the office. Signs like the one I passed on my run help to remind motorists that they aren’t the only ones on the road. It will be nice when the pendulum has swung back to the point where a true “share the road” philosophy is assumed and automatic. 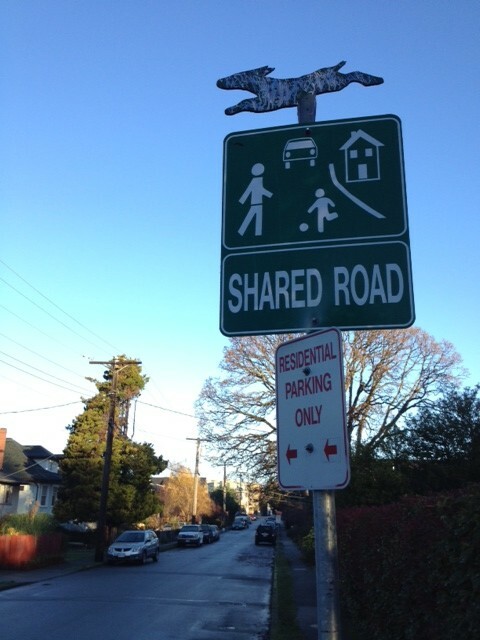 At that point, special share the road signs will no longer be necessary. Have you seen the 1907 film of a streetcar ride through part of downtown Victoria (http://www.youtube.com/watch?v=Pcl9XmApY-M)? One of the things that has always struck me about this film is the diversity of road users. There are relatively few cars, lots of pedestrians crossing mid-block, lots of cyclists navigating the streets, several different horse drawn vehicles, and a couple of other streetcars are even visible. It’s not exactly a mutli-modal utopia (the streets aren’t even paved), but it is nice to see that cars aren’t the primary method of locomotion on Victoria’s early streets. Yes, I have seen that clip as well as the San Francisco one. Amazing records of the way streets have evolved. Thanks for adding the link here.